1. A couple of Japanese and North American DS games--Which ones? Here are a few of the DS games I'd love to add to my ever-growing collection: the first Ace Attorney title, Final Fantasy Tactics A2, Ghost Trick and Okamiden. 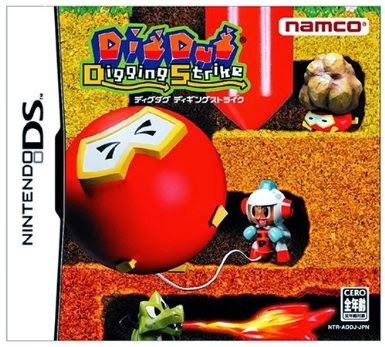 As for Japanese releases, the ones currently topping my "obtain as soon as humanly possible" list include Dig Dug: Digging Strike, Nanashi no Game and Ni no Kuni. 2. 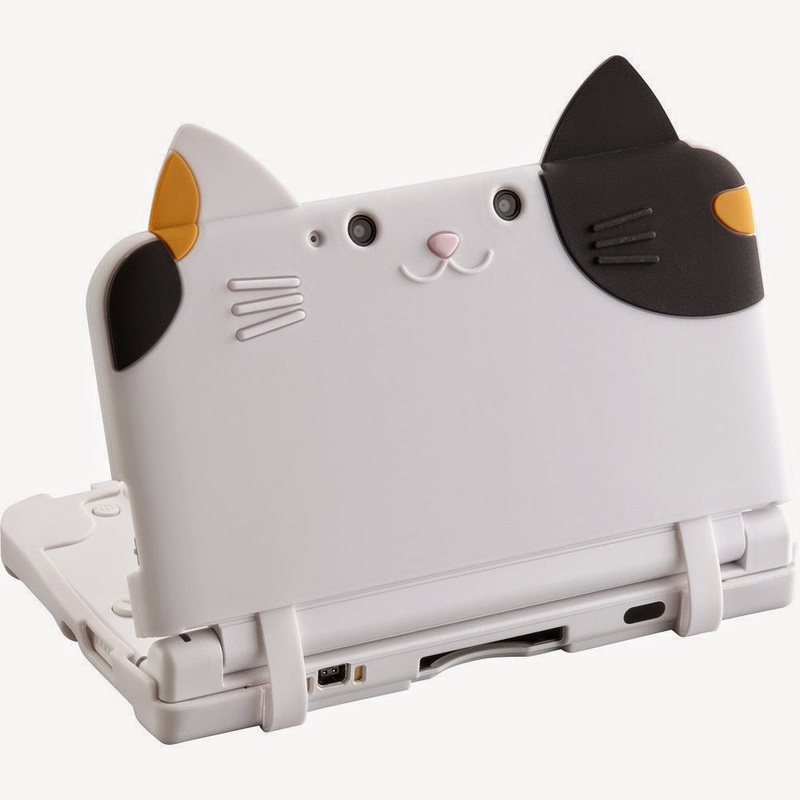 Cyber Neko-Nyan silicon cover for 3DS LL/XL--I've wanted one of these suckers ever since the guys over at Tiny Cartridge first mentioned them in a post. 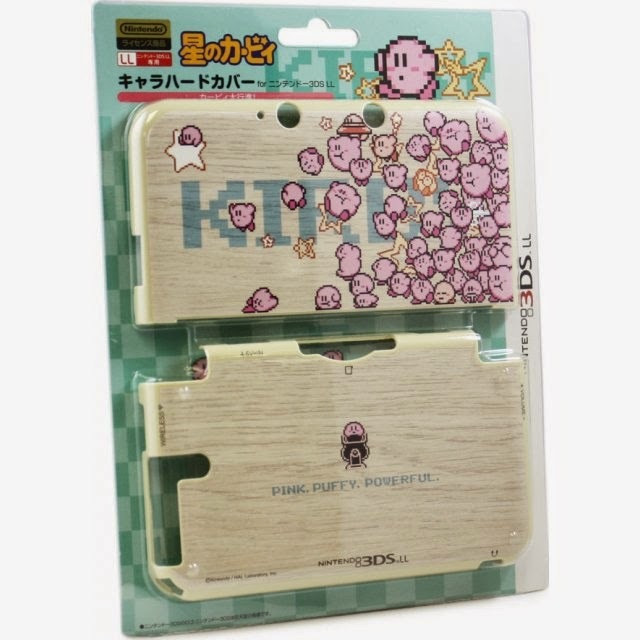 Specifically, I want the pink one for my pink-and-white (North American) 3DS XL and the tortoiseshell one (above) for my black-and-gold Pokémon Center (Japanese) 3DS LL. 3. Harvest Moon: The Lost Valley--Although I love that my parents got me a copy of Theatrhythm Final Fantasy: Curtain Call for my birthday, if I'm allowed to be completely honest, I kind of wished they'd gotten me this 3DS game instead, as I've been curious about it since the first screenshots of it popped up months ago. Oh, well, that's what wish lists like this are for, right? 5. 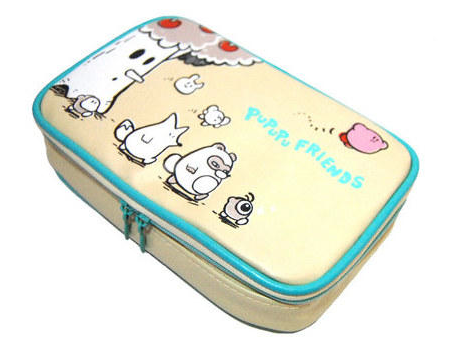 "Kirby Friends" soft pouch--Isn't this just the cutest thing? Seriously, it's so cute it makes me want to barf--and I mean that in the most positive way possible. Another reason I want one of these beauties (which can be bought here): I just know my pink-and-white 3DS XL would feel right at home tucked inside of it. 6. 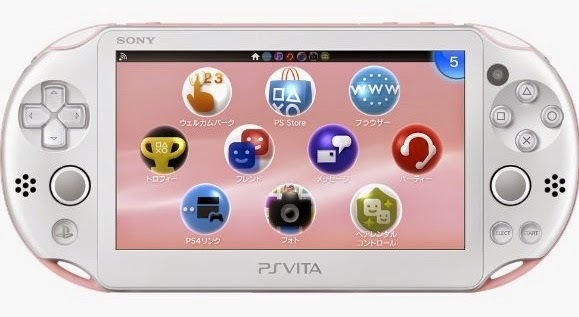 Light pink/white PS Vita--If I'm going to get a Vita, it's got to be the pink-tastic version showcased above. Sadly, it's only available in Japan at the moment (and is unlikely to ever see an official release in North America), but that's not as unfortunate as it sounds given the strength of the dollar--in comparison to the yen, at least--right now. Now that I've had my say, which systems, games or even game-related items are you hoping to receive from your loved ones this holiday season? I have a big thumbs up towards Phoenix Wright and Ghost Trick! And I've often considered importing that lime-green vita slim as well (they, unlike other unnameable portable systems, aren't region locked)! All I've got hopes for this Christmas are Smash for the Wii U, Persona Q, and (shortly after expressing my sadness over its absence in the US) a copy of Ni no Kuni DS! I've heard the Japanese in it isn't too rough, so I'm hoping it'll be a fun side project to help me as I learn. Ah, you're definitely not the first person to suggest I play Phoenix Wright and Ghost Trick ASAP, Zach. Thankfully, both are pretty cheap on Amazon right now, so assuming Santa doesn't bring them to me in a couple of weeks (he won't), I may just buy them for myself. As for your Christmas list: it looks pretty good to me! I, too, am curious about Persona Q and likely will buy myself a copy sometime next year. Wait. Okamiden? Would you be opposed to a used copy? Yeah! I'm also wondering whether or not I'm more excited for the game or the book it comes with... I loved it in the PS3 version, but it was suchhhhh a hassle to scroll around in with a controller. It'll be nice to have a physical copy, especially with all the pictures in it!! NiNoKuni DS?! That's a thing? Man...where have I been? It's a (very) beautiful thing. And relatively affordable right now! Oh, yes, I'm excited about the book, too, Zach. Anne over at the Chic Pixel blog shared photos of her copy of the book some time ago, and it looked GORGEOUS! I'm kind of surprised you missed this one, Justin! Sadly, though, it's a Japan-only game. 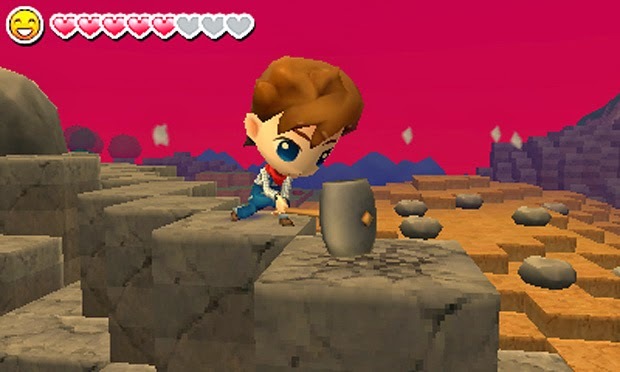 Anyway, I believe it has a similar story to the PS3 game, although the gameplay is slightly different. Also, it comes with an absolutely gorgeous book. I want it! Are you asking because you want to sell your copy, Justin? If so, how used is it (what condition is it in, basically), and how much would you want for it? From what I understand there's a point in the middle where it differs drastically from the PS3 version, but I don't know for sure! PS3's called the White Witch and DS's called the Black Mage... so I'm not quite sure. We'll have to share notes! Wait what!! I'm only a recent follower of hers so it must have flown past my radar. I'll have to check it out! I'm pretty sure the post in question was published some time ago, Zach. You should be able to find it by using the search function on her blog, though. Honestly, I hope XSEED will let me review Story of Seasons, but if not, I'll definitely pick it up! Oh, I just figured I'd send it to you, since I don't plan on playing it again (not that it wasn't good, just because I don't forsee myself playing it again). Consider it a thank-you present for being so generally awesome to me all the time. Maybe you can Facebook Message me your address. I've got it from the last time you sent something to me, but I can't read it entirely. Yeah, I like being able to go into a game blind now and then. It doesn't happen very often! Of course, another recent example is Hometown Story, which ... didn't turn out so well. It's going to happen again with The Lost Valley, isn't it? As for Story of Seasons: I hope you get a review copy! I'd ask for more but, honestly, timely reviews really aren't my thing, and whenever I get review copies I feel I have to review them as quickly as possible. So, I rarely ask anyone for review copies. Ha! Oh, wow, that's really nice of you, Justin! Thank you! I'll send my address via FB Message in just a few minutes. Please use the cheapest shipping method possible, OK? it doesn't matter if it takes ages to get here!